Today it became official. Toronto FC will join MLS in 2007 as possibly the 13th team in the league and the first to be located outside of the US. 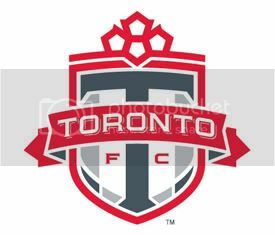 Maple Leaf Sports and Entertainment opted to go with Toronto FC over the proposed Inter Toronto FC. Personally, I'm kind of glad that they did. I'm tiring of the Euro wannabe names with FC Dallas, DC United, and to some extent the Houston Dynamo. My choice would have been to recycle the NASL's Toronto Blizzard name and logo. But that wasn't to be. "The absence of a conventional sports nickname is deliberate," said Tom Anselmi, executive vice-president and chief operating officer at Maple Leaf Sports & Entertainment. "We wanted the whole city to feel ownership and we want to provide the opportunity for a meaningful nickname to emerge over time." Construction for the 20,000-seat stadium remains on schedule and on-budget with excavation completed by May, while seat and turf installation will be completed by year's end. The stadium will open in time for the 2007 Major League Soccer season. Discussions are presently taking place with several organizations for the stadium naming rights. The facility will also play host to the FIFA Under-20 World Cup Championship in July 2007, an event that will garner an audience of more than 600 million worldwide. Knowing how long it's taken to get PaeTec Park up and running, I'll be very surprised if they can really pull off construction of a 20,000 seater that quickly given the weather that Toronto gets in the winter. Striker Magazine was dubbed "America's Ultimate Soccer Magazine" when it debuted a year or two ago. It looked a lot like SLAM, but since it was put together by the same people, that shouldn't have been a surprise. Unfortunately, the magazine flamed out quickly after a few solid issues. While it's absence wasn't a major deal in my life, I did miss the magazine. I'd stroll through the magazine area of my local Wegman's hoping that Striker would return. Then last evening, while I was chasing my two boys through Borders, what did I see? Could it be a World Cup Preview edition of Striker with Ronaldo on the cover? It was a little thinner than I remember and once I ripped it open, I found out why. This looks to be a one time thing as the only ads in site were from Nike. And pretty much every feature is on Nike athletes (Ronaldo, Wayne Rooney, Landon Donovan, DeMarcus Beasley, Zlatan Ibrahimovic, Cristiano Ronaldo, Rafael Marquez, Ruud Van Nistelrooy, and Thierry Henry). Carlos Valderrama is the only "non-Nike" guy that gets featured. I'm a little more than halfway through and I'm already planning on cutting it up and decorating my boys' room with pictures of Deuce, Gooch, DMB, Henry, Ronaldinho, and pretty much everyone else in the magazine. I'd plastered the pictures all over my bedroom, but I doubt my wife would approve. Alexi Lalas is disappointing me right now. The Galaxy dropped two road games in five days, get outscored by a combined 5 goals to nada, and Big Red doesn't drop the axe on Sampson? Add in that the Galaxy are now 1-3 since Lalas took over, with the lone win being at Real Salt Lake (could RSL stay in the top half of the USL 1st Division?). I'm really scratching my head in amazement that Lalas hasn't made the move that pretty much everyone expected to happen. I mean, how long did it take for people to go from hearing Lalas was the new president and GM with the Galaxy to thinking that Steve Sampson was in trouble? It took me about a minute. But, I hadn't had my coffee yet. Taylor Twellman cleaned up a lose ball in the LA box in the 5th minute on Saturday. It was probably the first thing that had gone right for Twellman all week. On Tuesday, Twellman found out that Brian Ching had been given the 4th forward spot on the US World Cup roster. Then on Thursday, Taylor's grandfather, former Major League Baseball player Jim Delsing, passed away. The goal obviously didn't make the pain of losing his grandfather go away, but Taylor took heart in knowing that his grandfather would want him to keep playing. Plus, Twellman only needs to look at LA Galaxy defender Chris Albright for reasons to keep playing hard, despite being left off the initial 23 man roster. Albright received the same bad news on Tuesday that Twellman had. But, less than 48 hours later, Albright was on the 23 man US roster due to a knee injury sustained by Frankie Hejduk. If Twellman keeps scoring goals for New England, perhaps he'll be headed to Germany after all.